These “butterflies of the ocean” are beautiful, deadly, and strange. 1. THERE ARE MORE THAN 3000 SPECIES. The bizarre, beautiful sea slugs called nudibranchs can be found in marine environments all over the world. Like orchids, nudibranchs vary widely in color and arrangement. Some sport the typical slug shape; others look like bottle brushes, internal organs, or Christmas ornaments. 2. THEY’RE NOT FOR EATING. 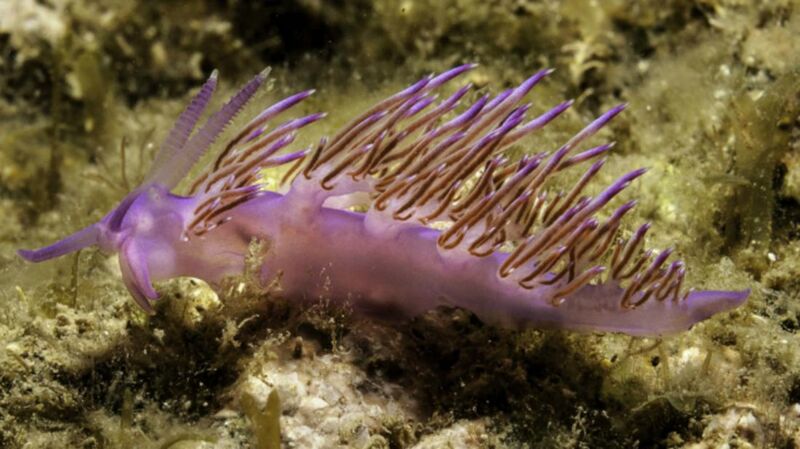 Nudibranch expert Karen Cheney calls the slugs the “butterflies of the ocean,” both for their Technicolor appearance and their intense toxicity. Like the bright wings of butterflies, nudibranchs’ loud coloration is a warning sign to potential predators that the slugs are not worth the pain. Still, only a few species present much of a threat to humans. Anyone who grabs the blue dragon (Glaucus atlanticus), pictured above, will end up with a handful of regret. In an O. Henry-style twist, a nudibranch will never see its own magnificence. Unlike the peepers of their terrestrial cousins, the eyes of sea slugs are extremely primitive and likely only detect light and dark. Nudibranchs do most of their navigating by scent, which they take in through the feather-like rhinophores on their heads. 4. SOME NUDIBRANCHS RUN ON GREEN ENERGY. Some nudibranch species have evolved the plant-like ability to photosynthesize, or live off sunlight. The Elysia chlorotica shown here swipes photosynthesizing cells and genes from the algae it eats. When there’s no algae to be found, the slug can run entirely on solar power. 5. THEY CAN PLAY BOTH PARTS. Like most snails and slugs, nudibranchs are hermaphroditic, which really lets them make the most of each mating encounter. Two slugs line up facing in opposite directions, then plug their penises into each other, giving and receiving sperm at the same time. 6. THEIR GLORY IS SHORT-LIVED. Nudibranch lifespans vary by species, but none live to be more than a year old. 7. SOME ARE REALLY, REALLY CUTE. The “sea bunny” nudibranch Jorunna parva took the Internet by storm last summer, and it’s easy to see why.